The Kadou Coffee table top is made of painted metal, and it is available in white, anthracite grey and dove-grey. 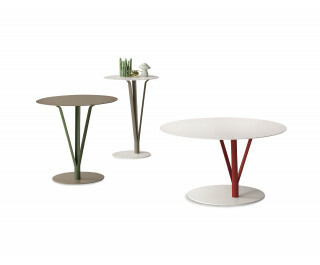 The legs, which are also in painted metal and arranged in an asymmetrical fashion with respect to the base and top, can be chosen among a series of colours. Kadou Coffee is available in three versions: Kadou Coffee high, Kadou Coffee medium e Kadou Coffee low. In each of them the height of the coffee table and the diameter of the tops are different.